BLACK MEN IN FASHION: PAVING THE WAY OR STEALING THE SPOTLIGHT? After giving in to my ceaseless craving for a fashion film binge-watching session (consisting of The September Issue (2009) and In Vogue: The Editor's Eye (2012), I sat internally battling between being inspired and pissed off. The world of fashion has been designed to best suit the upper echelons of the industry, propelling those who are predominantly either white females or white gay males to the top. However, there is a new paradigm for diversity in the fashion industry and Edward Enninful, first black editor-in-chief of British Vogue, is seated at diversity's throne reigning supreme. In addition to Enninful, other distinguishable fashion figures like André Leon Talley, Olivier Rousteing and Virgil Abloh have become the trailblazers for black men in the industry—but have they paved the way for black women or stolen the spotlight? At the rate the world around us is moving in terms of social justice and diversity, one can only hope that these beloved fashion luminaries represent only the tip of the iceberg when it comes to diversity in fashion, but it still is not enough. When it comes to the statistics of black women in fashion, something simply does not add up. Under the microscope, statistics from major fashion schools such as the Fashion Institute of Technology prove that their students are primarily female at 85% with a small percentage of 9% of known black students. So, with such a minute percentage of black students in unison with such a large percentage of female students, why is it that black men seem to be in the spotlight? In The Glass Runway: How Gender and Sexuality Shape the Spotlight in Fashion Design, Dr. Alyson Stoker explores the concept of the "glass runway" in fashion. This theory suggests that although the fashion industry is a highly feminized field, men (especially gay men) in the business of fashion are "pushed down the runway", achieving greater fame, praise and publicity. In Vogue: The Editor's Eye (2012) highlights Vogue's most iconic fashion editors and directors: Babs Simpson, Grace Coddington, Tonne Goodman, Phyllis Posnick, Jade Hobson, Carlyne Cerf, Polly Mellen and Anna Wintour (with commentary from Hamish Bowles), praising their contribution to the magazine that Vogue has become. The problem? For those who aren't aware, this group of icons features an entirely white female cast with the exception of Bowles, who is a white gay male. 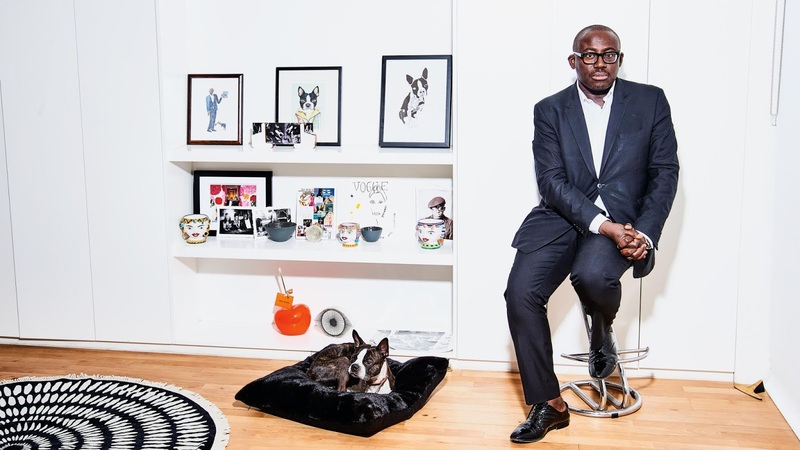 If there were an updated instalment of In Vogue that stretched overseas to British Vogue, we would be introduced to Edward Enninful, who would sit in striking contrast to his predecessors. 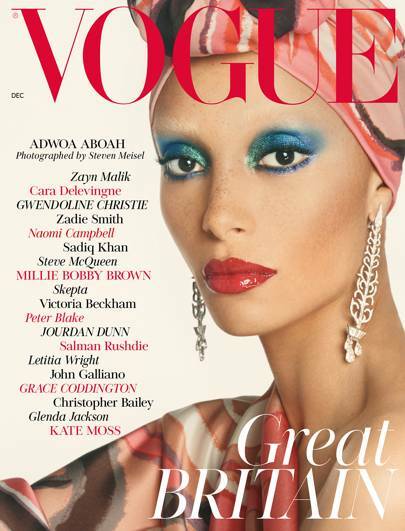 In 2017, Enninful's first issue of British Vogue featured biracial model Adwoa Aboah on its cover and still, over a year after his appointment as editor-in-chief, it is evident that the Enninful effect truly exits and it's infectious. Last year, super model legend and close friend of Enninful, Naomi Campbell, called out the previous editor-in-chief of British Vogue in an Instagram post, sparking a much needed conversation about diversity in the industry. 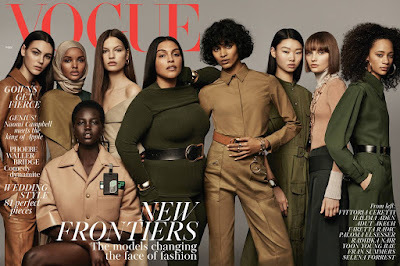 British Vogue's most recent May cover displays nine diverse models—making British Vogue history by including the first hijab-wearing model on its cover in its 102-year existence. To see any minority, be it race or gender, battle for success and come out on top in this industry is commendable. To take that success and effectively use your position of power at a renowned publication such as British Vogue to introduce, collaborate with and provide opportunities for fellow minorities like black women is impeccable. It is safe to say that Enninful is undoubtedly making moves for black women in fashion, despite the fact that he is a man and I'm here for it. I couldn't have chosen a better time to dive into the world of fashion journalism—and there are no words to describe my excitement about being part of an era where diversity and social justice are both the forefront and future of the fashion industry. Who better to tackle such pressing issues than those who have dealt with them first hand? © LAUR. Design by FCD.